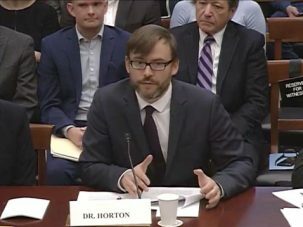 In a hearing before the House Subcommittee on Environment, Lamont-Doherty climatologist Radley Horton delivered sobering remarks about how climate change will impact our coastlines, economy, and society at large. Congress is exploring mitigation and adaptation strategies to prepare for one of the most dangerous threats associated with global climate change: sea level rise. Today, the House Subcommittee on the Environment, a subcommittee of the House Science, Space and Technology Committee, held a hearing entitled Sea Change: Impacts of Climate Change on Our Oceans and Coasts. Lamont Associate Research Professor and climatologist Radley Horton was among four top ocean experts to testify before the subcommittee. He delivered sobering remarks. Horton went on to describe predictions, including more frequent coastal flooding and more intense and higher magnitude flooding. He detailed the societal and economic impacts as well. Rep. Fletcher, a Democrat, noted Hurricane Harvey set a record for total rainfall from a tropical cyclone, and said she is encouraged that her colleagues in Congress are interested in learning about climate change and its impacts. She said today’s hearing was to lay “the foundation for future discussions” that will lead to legislative solutions. The subcommittee meeting took place two weeks after the full House Committee met to discuss climate change and its impacts. Today, Democratic and Republican members expressed concern about ocean health, noting the global ocean’s role in sustaining humanity, controlling global warming and the carbon dioxide budget. They also noted there is still much unknown and much to be explored, which requires investment. “The ocean is vast and it’s very difficult to be everywhere and explore all the processes,” said Sarah Cooley, director of the Ocean Acidification Program at the Ocean Conservancy. 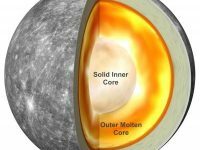 She said there are obstacles to ocean exploration despite substantial advances in remote observing systems such as autonomous devices and satellites. 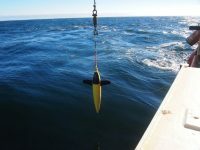 “Bringing the information together and making sure there’s no drift in the instruments still requires some individuals to be out there sampling. An integrated viewpoint on what it happening in the ocean is important,” said Cooley. Click here to watch the entire hearing. The full text of Professor Horton’s written testimony can be found here.